Current U.S. national healthcare expenditure continues to outpace national inflation rates. As a specific procedure, esophagectomy can be a morbid and costly operation and there is value in examining the burden of surgical expenditures associated with this procedure in order to better guide treatment priorities. Consequently, we aimed to evaluate charges for esophagectomies relative to long-term shifts in U.S. healthcare spending, and to determine the drivers of increased cost. The Nationwide Inpatient Sample (NIS) was queried for esophagectomies performed between 2001 and 2014. Charges were estimated based on standard indices. Current inflation and patient out-of-pocket expenses were corrected using the Consumer Price Index (CPIall) and the medical subset of the CPI (CPImed) respectively. The Milliman Medical Index (MMI) was used to adjust for inflation in respect to the total projected annual healthcare costs for esophagectomy. Log-linear regression was applied to determine the effects of admission-specific variables on hospital charges. 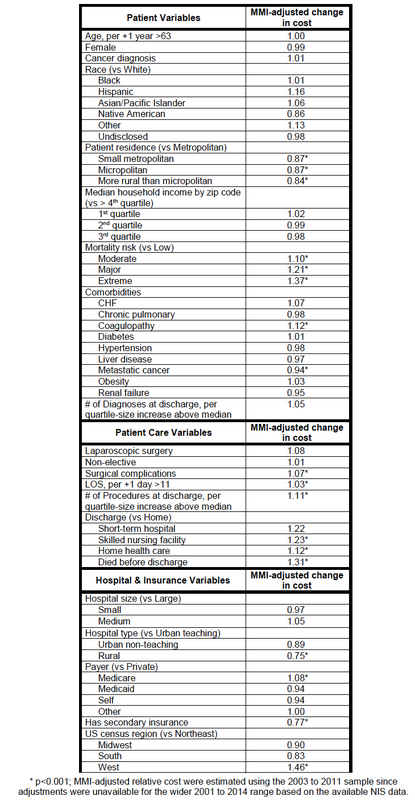 Patient, hospital, and insurance covariates were also evaluated as potential cost drivers on total hospital charges after adjustment for healthcare price inflation, using a stringent p-value criterion. 10,075 esophagectomies were extracted for analysis. Mortality after esophagectomy decreased from 7.6% to 2.3% over the study period. From an economic standpoint, hospital charges have increased, both when adjusted for currency inflation (CPIall, +52%) and for out-of-pocket medical cost inflation (CPImed, +30%). Interestingly, procedure-specific total hospital charges, as defined by the MMI, have declined over the study period contrary to major economic trends (Figure 1). Higher preoperative mortality risk and specific patient co-morbidities are associated with poorer patient-related outcomes with increased charges. Likewise, postoperative complications, multiple procedures, length of hospital stay, and discharge disposition also significantly raised charges. Procedures performed in the Western U.S. and having Medicare as primary healthcare payer, incurred higher hospital charges (Table 1). 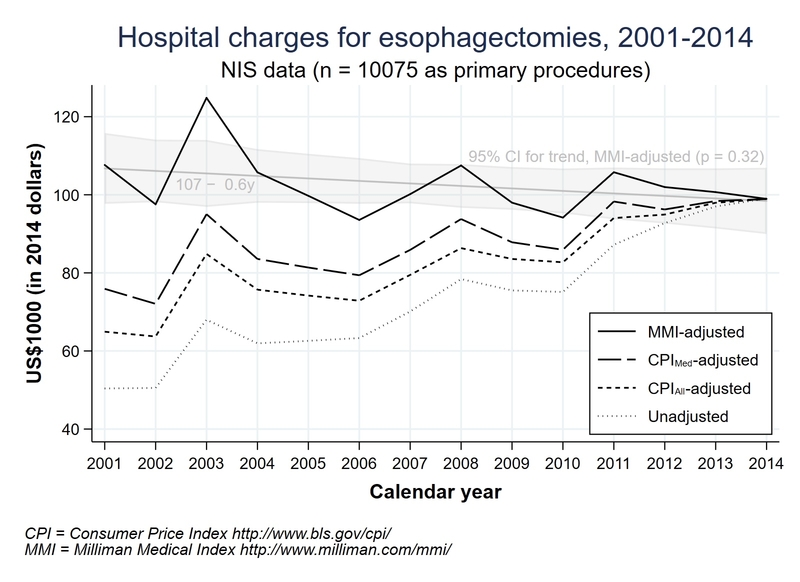 Against a backdrop of increasing national healthcare costs, hospital esophagectomy charges have seen a steady decline. Pre-operative rehabilitation of high risk patients, optimization of co-morbidities, and improved patient selection may further reduce costs by minimizing surgical complications, length of stay and aligning postoperative disposition. Higher hospital charges in the Western United States, and reliance on Medicare to provide the majority of reimbursement for the surgical treatment of major esophageal disease may further drive a robust healthcare discussion.